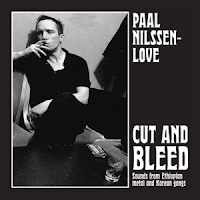 "Cut and Bleed," the latest album from renowned percussionist Paal Nilssen-Love, came about at the request of the recording label Ideal. 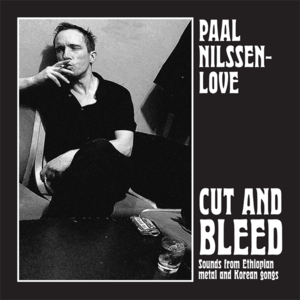 Nilssen-Love proceeded to make two tracks, solo, recorded directly to tape. The result is an amazing solo effort that takes traditional ethnic percussion -- Korean gongs and Ethiopian metal (what kind of metal percussion is not stated) -- and produces an album that is rich, varied, and transcendent. Nilssen-Love uses the Ethiopian instruments to create a storm of sound, on the surface seemingly a cacophony, but on closer listening one can hear the composition manifest itself. Clashes, rumbles, objects that sound like they are being dropped or spilling down a flight of stairs, are all carefully arranged. The seeming chaos gives way to moments of serene calm and mysticism, played with the Korean gongs. They add dimension and space, providing counterpoint to the dense noise. Back and forth, Nilssen-Love alternates between the soft and loud, molding the percussive sound like aural clay. There is tension, tranquility, violence, and gentleness. The inventive interplay is what sustains a listener's interest throughout, and while the two tracks, both untitled, are each about 20 minutes in length, it feels much shorter than that. Cut and Bleed not only demonstrate the artist's skill, but how one can take traditional instruments and transform their roles into a different kind of music. It is percussion improvisation at its finest, and gets my highest recommendation.